Pakistani troops have ended a major operation to flush out al Qaeda suspects and their local supporters from hideouts in a remote region near Afghanistan. An army spokesman said Monday that 72 people died, including 17 security personnel. The United States military in Afghanistan praised the operation, but said it was not aware that any al Qaeda leaders had been captured. Even as the five-day operation ended in South Waziristan, two Pakistani soldiers and a driver were killed and three injured Monday in the bombing of a vehicle carrying paramilitary forces in neighboring North Waziristan. Also, Pakistani intelligence agents exchanged gunfire with al Qaeda suspects near a northern city, killing one militant. The operation was launched after foreign militants killed 15 security personnel near the town of Shakai, 210 miles west of the capital, Islamabad, last Wednesday, Maj. Gen. Shaukat Sultan said. Army soldiers, backed by artillery, helicopter gunships and jet fighters, targeted rebel hideouts. 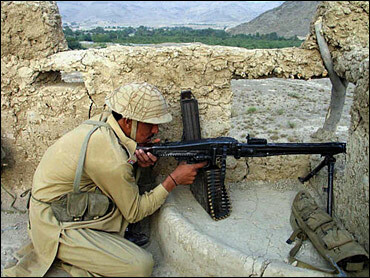 The operation left 55 militants dead, he said. Two more soldiers were killed during the action. Sultan said all the slain militants were terrorists, but he declined to reveal their identities or nationalities. The army also recovered a huge cache of arms, including heavy weapons and ammunition. A senior security official, speaking on condition of anonymity, said some of those killed were foreigners and efforts were underway to identify them and confirm their links with al Qaeda. The official said it was not clear if the dead men had links with leaders of the terror network. Pakistan's tribal regions bordering Afghanistan are considered a possible hideout for Osama bin Laden and his chief aide, Ayman al-Zawahri. The operation followed weeks of unsuccessful efforts to get hundreds of suspected al Qaeda and Taliban fighters, said to be a mix of Arabs, Central Asians, Afghans and Uzbeks, to register with authorities. Sultan said Pakistani security forces on Sunday opened fire on some vehicles carrying Afghans when they crossed into Pakistan from Afghanistan, and according to radio intercepts, eight of the intruders were killed. Sultan said others fled back to Afghanistan, leaving behind two vehicles. Pakistan has deployed about 70,000 troops in its tribal regions to prevent Taliban and al Qaeda fugitives from sneaking into Pakistan after President Gen. Pervez Musharraf made this Islamic nation a key ally of the United States in its war on terror. Musharraf's support for the United States after Sept. 11 has pitted him against radical clerics, recent Pakistani policy and the normal relationship between the central government and the outlying regions where al Qaeda is suspected of hiding. Pakistan's ISI intelligence service was instrumental to the development of the Taliban in neighboring Afghanistan. Clerics have denounced Musharraf for terminating that support and aligning with the Americans. Musharraf has survived multiple assassination attempts in the past year. In the southern Pakistani city of Karachi, a militant accused in the killings of about 100 Shiite Muslims was arrested Sunday, a senior security official said Monday. Dawood Badini, a leader of the al Qaeda-linked group, Lashkar-e-Jhangvi, was captured in a raid on a home, said Maj. Gen. Javed Zia, head of the paramilitary rangers for southern Sindh province. He said Badini orchestrated three attacks against minority Shiites in southwestern city of Quetta in 2003 and 2004, which killed 99 people. Lashkar is a Sunni Muslim militant group. Police say Badini is a brother-in-law of Ramzi Yousef, who is serving a life term in the United States for the 1993 World Trade Center bombings, although his family on Monday denied any such marriage ties, saying his sisters were either single or married to cousins.